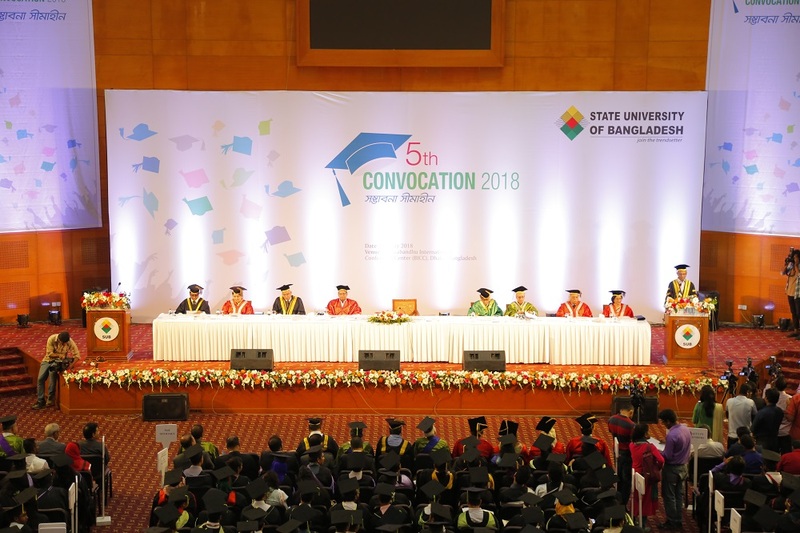 State University of Bangladesh (SUB) is going to hold its 5th Convocation on 9 May 2018. A total of 2263 students passing between Spring-2016 and Fall-2017 semesters will be awarded with their degrees in the convocation. Mr. Nurul Islam Nahid, MP, Hon’ble Minister, Ministry of Education of the Government of People’s Republic of Bangladesh will preside over the program and confer the degrees as the representative of His Excellency Mr. Md. Abdul Hamid, Hon’ble President of the Government of People’s Republic of Bangladesh, and Chancellor, State University of Bangladesh (SUB). Professor Abdullah Abu Sayeed, founder – Bishwo Sahitya Kendro will be the Convocation Speaker. Professor Abdul Mannan, Chairman, University Grants Commission of Bangladesh will be present as the Special Guest while Professor Dr. Md. Sayeed Salam, Vice-Chancellor, and Dr. A M Shamim, President, Board of Trustees of SUB will be present there among others. In the 5th Convocation, 2 students have been nominated for the Chancellor’s Award while 21 and 44 students will be awarded with the Vice-Chancellor’s and Dean’s Awards respectively. The convocation will end formally with a cultural program.